85 % of Customers would not know your location without Signage. Pylon Signs are freestanding structures, typically placed perpendicular to the road in close relation to a business to attract attention. From initial design concepts to complicated manufacturing and installation procedures, Blanchett Neon is the choice of businesses across Western Canada for freestanding pylon signage. Catch the eye of existing and new customers where they are able to stop and visit your business; capitalize on impulse shopping at the point of sale. Learn more about the benefits of upgrading your Multi-Tenant Pylon with Digital Signage. Shopping centres, professional buildings and large warehouse spaces all have the need for Effective Pylon Signage. Landlords or property managers: give your tenants the opportunity to advertise their location within your centre or building by renting or leasing space on a property pylon sign. Blanchett Neon will work with your specific centre’s needs to design the tenant panels to allow for flexible panel size and spacing. Rent or lease out individual panel spaces on your pylon signage to your tenants to feel the return on investment of your custom pylon sign in only a couple of years. By offering valuable, visible advertising on a well-placed multi-tenant pylon sign that gives their business optimum exposure to your centre, and to their business. The most effective signage for any business or organization is a freestanding pylon sign placed perpendicular to the road with a creative design concept to attract attention and effective wording to market your business. Attract attention and improve visibility to your business with a professionally designed, dedicated pylon sign that complements your building. Every painted aspect of our signage will be properly sanded, primed, and then painted with only the highest quality paint products to ensure maximum life of the steel and metal products without rusting or fading. We use Matthews paint products that are intended for outdoor signage applications. Our experienced team will ensure your signage has the proper amount of even illumination by using the highest quality LED and / or fluorescent illumination products that are best suited for your unique signage display, and work within your needs and budget. 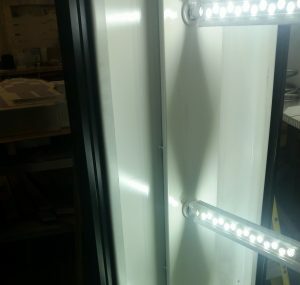 Extensive Research and Development initiatives have been completed in-house to determine proper centre-to-centre spacing for best illumination output. We partner with a wide variety of suppliers that stand behind their products with warranty guarantees. For added peace of mind, talk to your Blanchett Representative about the advantages of LED illumination. All structural steel used in our Freestanding Pylon Signs is ordered through local steel companies, ground smooth, primed and then painted. Production drawings (including all internal support structures) are based on industry standards, and if required by the customer or permitting officials, can be reviewed and stamped by professional engineers to ensure structural integrity. From tenant panels to headers cabinets, 3/16″ thick white lexan plastic is most commonly used to add strength and durability to our signage. Other products commonly used include acrylic and flex-face based on the application, size and intended use. Blanchett Neon is proud to be a 3M authorized dealer, passing along the benefits of the Industry-Leader in film, as well as 3M’s extensive film warranty to our clients. In addition to standard vinyl film colours, we also have a digital printer in our shop for the more intricate and detailed designs, giving our customers the freedom of choice.